I went out yesterday in spite of the rain. I got wet, but it was one of the best rides I’ve ever taken. One road I traversed yesterday was San Juan County Road 14. I’d never been before, so this was new exploration for me—I found the views incomparable and the wildflowers spectacular. I took a nice GPS track, which appears below. A view from the rooftop! This picture is taken from near the summit on San Juan County Road 14 and looks south. You can see several rain cells. Yes, I got wet. San Juan, Colorado, County Road 14 is well maintained and pretty much looks like this for its entire distance. The first thing that hit me was the profusion of wildflowers, which I’ll cover in a separate post. CR 14 quickly climbs and comes out above tree line. The views are spectacular, as shown in the leading photo. Also, I was able to see Black Bear Pass Road across the valley (see photo). Black Bear Pass Road also departs US Hwy 550 just south of Red Mountain Pass, but to the west. 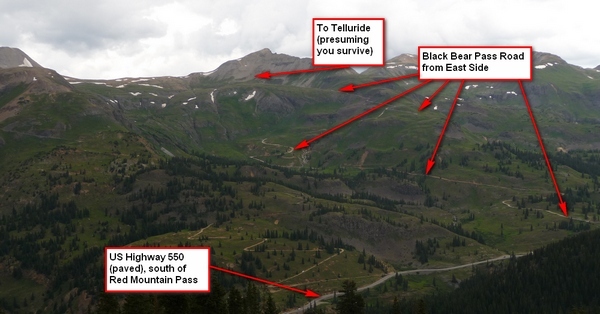 As you can see from the photo, even the eastern approach to Black Bear Pass offers some steep climbs. Of course, it’s the descent into Telluride that makes it so interesting (no, you don’t want to try it unless you’re an expert). From above tree line on San Juan County Road 14, here's the view across the valley. That's the eastern part of Black Bear Pass Road. 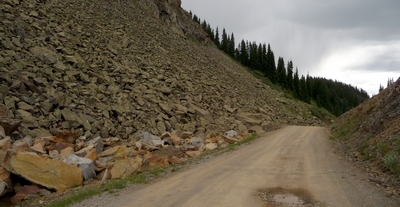 BBP Road is an intermediate road up to the pass itself. Beyond that, you need to be expert++. Back to CR 14: The road has a few steep spots but nothing too hard. I was able to sit for most of the ride, standing only when I thought the road a bit steep. There are a few switchbacks—I usually stood for those too. Now, before I provide the all-important GPS track for this delightful road, I’ll note that the rain shown in the top picture moved around. I intercepted it a few times. Even though it was July 24th, it was plenty cold up there at altitude, soaked through and still raining. Fortunately, the road surface was such that I didn’t run into any traction issues. Also—and this is critical—there was no lightning. If there had been, I would have sought shelter much further down the mountain! Here's the GPS track. I traveled the road from north to south. The road is a bit steep in places but the road surface is excellent (for dirt-biking, that is) with very little scree and not much exposed rock. This entry was posted in Motorcycling, San Juan County. Bookmark the permalink. Russ, I have been to the blowout, but not on the bike. That side of the mountain is a rabbit’s warren of roads, so I’m not sure I could find my way back. I think getting there involves traveling through private land. I was there to help put up a temporary digipeater that our club used to provide communications support for the Hard Rock 100 race. I have some amazing pictures—it really is way up on the side of the mountain! PS, I waste way too much work time on your web site! PPS, I’ll ping you on 146.79 (I think that is the freq you monitor, I’ll double check) when I come through in two weeks. Enjoy your site, thanks for sharing info on the area. 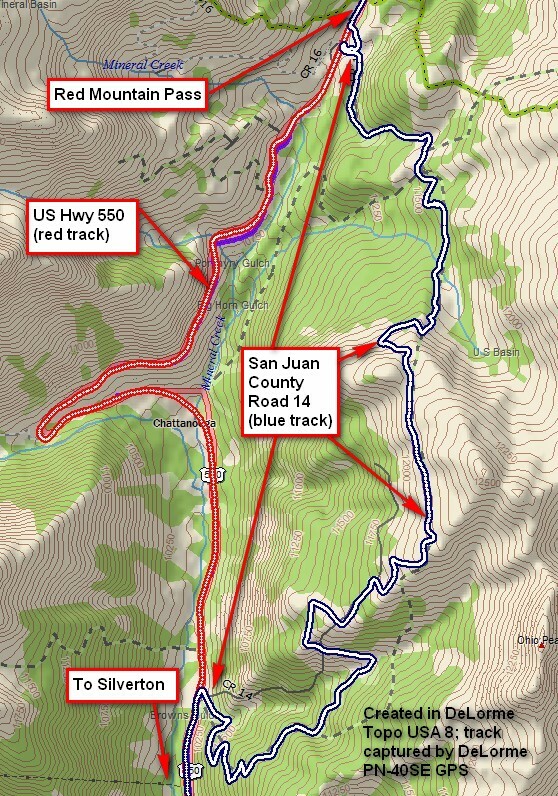 Will go over in detail the next few weeks but in the meantime can you recommend some paper maps of the Ouray area? I’m trying to find some county maps and not topo maps Want to ride the Black Bear and the surrounding trails mostly south and west of Ouray. 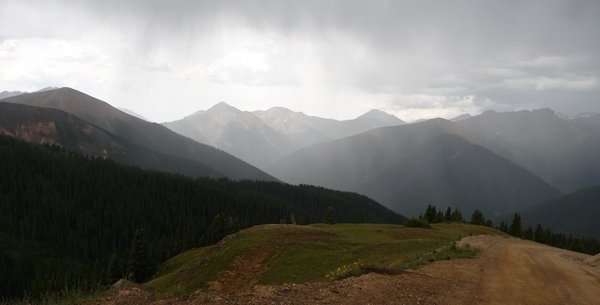 We’ve ridden the trails east of Ouray towards Lake City.We’re planning some riding there in late July this year. I bought a DR400S just to come to Colorado and ride the jeep trail passes. Again thanks for sharing your information and like your photographs too.